-Peter Seivewright. International concert pianist. She has already played for the Queen and the Dalai Lama – now harpist Phamie Gow has been invited to meet musical royalty Stevie Wonder. 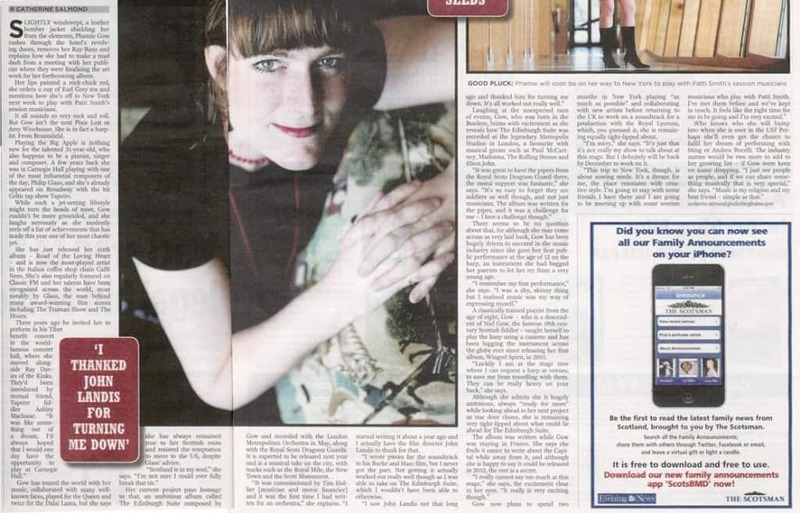 Gow, 31, who lives in Bruntsfield, has just returned from a whirlwind two-month trip to New York and Canada, which she spent networking, performing for music industry high-fliers, and marking St Andrew’s Day with a gig at the Canadian Parliament. The harpist, who is also a pianist, singer and composer, travelled to New York at the end of September, just after releasing her sixth album, Road of the Loving Heart. She said the trip opened countless doors – including the promise of a rendezvous with Stevie Wonder, after she met his friend, the jazz flautist Bobbi Humphrey, at a glittering event organised by DEX, aka designer make-up artist Dexter Phillip. She said: “The room was full of millionaires and a TV crew were filming footage. DEX is keen to do my make-up for my next music video. 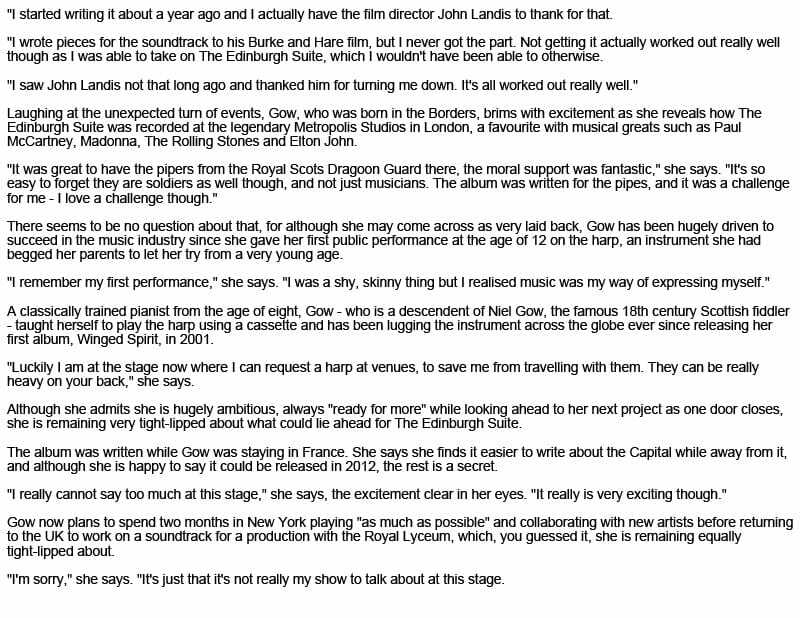 During her trip, she was also invited by the American Scottish Foundation to play at an awards ceremony at the beginning of November, and there she was spotted by Scottish cultural ambassador Robin Naysmith, who invited her to play in Canada. After a gig in Toronto she went to the Canadian Parliament in Ottawa, where culture secretary Fiona Hyslop introduced her to an audience of politicians and guests to mark St Andrew’s Day. She is now back in Edinburgh, writing and being the musical director of the forthcoming performance of The Infamous Brothers Davenport at the Royal Lyceum, but she hopes to head back to the US in the future. During her trip she was also signed up to take part in next year’s Tartan Week in New York, and says she has a number of other projects “bubbling away”. Download PDF of the article. A FORMER Moffat musician and composer has hit another high note in her career. It’s been a busy summer for Westruther musician Phamie Gow. Not content with composing, recording and co-producing a new album she has also performed at the opening of this year’s Edinburgh Military Tattoo and at an open air concert in Italy. WESTRUTHER multi-instrumentalist Phamie Gow helped open this year’s Edinburgh Tattoo from inside the city’s castle. Scots piano and harp composer Phamie – her War Song has become a Classic FM favourite – is pioneering a Celtic-crossover musical scene, with traditional Scottish echoes embedded in restful, lyrical melodies. This smooth piano collection is calming and hypnotic – easy listening, yes, but with much more depth than the genre usually serves up. 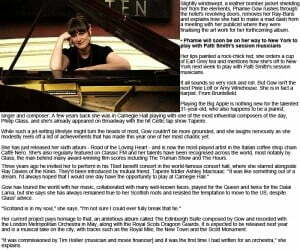 Phamie has already performed with US composer Philip Glass. Good to see an original artist breaking out on her own, and she’s a name for the future. City Harpist Phamie Gow will play the clarsach as part of the programme of events when the Queen opens the fourth session of parliament tomorrow. She has been invited to perform a mixture of traditional and original work in the Holyrood building’s main hall during the parliament’s opening afternoon. Multi talented composer and musician Phamie Gow has led a rather successful musical life as she approaches the release of her new record, Road Of A Loving Heart, which sees the light of day on Monday. Standing strong as Gow’s sixth record Road Of The Loving Heart combines Gow’s talents behind a piano with some delightfully crafted self penned numbers of gentle instrumentation. Starting her career in music at an early age Gow released her first record at the age of 19. 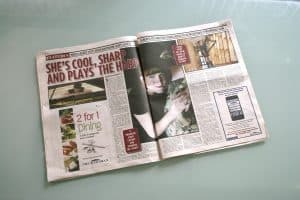 Over the years she has worked hard to establish herself as one of the countries most musically gifted artists and has gone on to become a regular featured act on Classic FM, Europe’s most recognised and listened to classical music radio station as well as claiming the title of Caffé Nero’s most played artist throughout the UK. Road Of The Loving Heart is a gentle collection of warm and charming piano numbers that Gow has composed with faultless precision. Known primarily for her skills on the harp Gow has this time substituted her strings for the keys of a piano and built a generous collection of 13 instrumental gems. Though the tracks on Road Of The Loving Heart are all instrumental numbers each hold their own special position within the record and have their own character on the album that sets them apart from the next. London is minimalist piano balladry at its best which is drenched in sorrowful tinkerings and a mournful melody while Regresso A Chile contains some sweet and fast paced fingerwork with a harder approach to it. The following Au Revoir Elsaalso contains a darker feel within its two minute duration that adds a more eerie and darker edge to the centre of the album. With a successful tour of Europe to promote the record Gow is quickly becoming a household name with her charismatic approach to songwriting and a knack for penning some memorable and gifted easy listening records. Known in Scotland as a harp player, the young Gow was taught piano by the virtuoso pianist Ronald Stevenson, and this album celebrates her love of that instrument. Still in her twenties, Gow has just moved from Barcelona to Montpelier in France, where these 14 original compositions (one is a video) were recorded. Played live, unedited and with no other instruments, this is a beautifully understated, lovingly expressed collection of moving musical invention. Here are some of the comments the public have written (via youtube.com) to Phamie about her music…. “Chinese people say “i shin den shin” which means “from my heart to your heart”… as a candle lights an other candle. I think that your music is like that, direct to the heart. What you give is not just music, it’s bread, food for the hungry. HARPIST Phamie Gow could hardly believe her eyes as she scrolled down the lengthy text message from her dad. 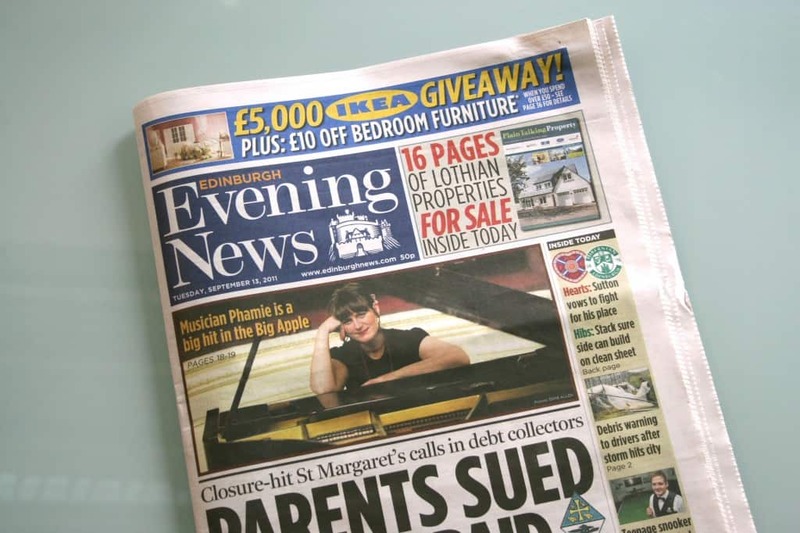 He had just had a call inviting his young Edinburgh-based daughter to perform at New York’s famous Carnegie Hall with Oscar nominated composer Philip Glass. The 28-year-old had met the composer of soundtracks for The Hours, starring Nicole Kidman, and Martin Scorsese’s Kundun, through a mutual friend just weeks before. But working with Glass, who has been cited as an influence by rock stars David Bowie and Brian Eno, was something of which Phamie, a talented composer herself, had only dreamed. Appearing in next Wednesday’s Tibet benefit concert, directed by Glass and featuring stars including Ray Davies of The Kinks, is the latest high in Phamie’s career, which has seen the self-taught harpist rise from playing at a school concert aged 12, to performing on Broadway with hit Celtic tap show Tapeire. Seeing the holy man’s picture reminded her of when she performed in front of Tibet’s spiritual leader at the Usher Hall during his visit to Edinburgh in 2004. But modestly, she didn’t mention the connection to Glass immediately. “I didn’t tell him at that moment because when you meet someone so famous you don’t want to talk about yourself. But I thought that was amazing,” she confides. She was back in the Capital for the Hogmanay festivities and played the electric harp in George Street for The Night Afore celebrations on December 30. Clearly used to performing for large audiences, nerves don’t seem to be a problem for Phamie. A graduate of the Royal Scottish Academy of Music and Drama, Phamie plays the Celtic modern lever harp â€“ acoustic and electric â€“ piano, accordion and whistle, as well as singing. Her first big break came when she was 19 and won an award in the Celtic Connections Festival, which allowed her to make a wish list of musicians to work with. She chose fiddler Alisdair Fraser and seven others, who collaborated on her second CD Lammermuir, which was a New Voices commission for Celtic Connections and was recorded live at the Glasgow Royal Concert Hall. At the moment, between giving workshops, the multi-talented musician, who has worked with top names in piping, including Galician “gaitero” Carlos Nunez and Irish Uilleann piper, Davy Spillane, is busy promoting her current album, a piano CD called Moments in Time. Phamie Gow in Edinburgh to launch her new album. FRESH from her success all over the world, a Westruther musician headed home to Scotland last week for the release of her new album. Phamie Gow, most famous for her work on the harp, chose the Coda Music Shop in Edinburgh as the venue to debut her latest collection, ‘Moments in Time’, which has already received the seal of approval from Classic FM after it found its way onto their playlist. What is probably most surprising, is that rather than display her criticially acclaimed playing of the harp, on ‘Moments of Time’ every track is a solo piano piece. However, it was the piano that gave Phamie her first venture into the world of music when she had her first lesson at the age of eight. And despite taking to the harp like a duck to water, Phamie has never turned her back on the piano and is a visiting tutor of piano and composition at the Royal Scottish Academy of Music and Drama on her periodic trips back from Spain, where she has spent the last 18 months living in Barcelona, playing many concert halls, performing on radio and even having the honour of her show being broadcast live on nationwide television. In fact Phamie has gained many fans not just in Europe but all over the world including America where she heard one of her songs played on the radio and in Italy when she was recognised when she was walking down the street. However, so far widespread success in Britain has proved elusive, although Phamie is hoping that the Scottish influences in ‘Moments of Time’ and increased interest in her music will help her to make more of an impact. Talking about her new album, Phamie said: “The album has a classical feel to it yet springs from a deep love of Scotland, it’s places, people and history. Although Phamie has travelled all over the world and had a taste of many cultures and traditions, a lot of her influences can be traced closer to home. One of the tracks on the new CD is ‘The Night Fold’, the name of a field at Fingerpost Farm in Westruther and one of her most successful albums to date is ‘Lammermuir’, which is heavily based on Phamie’s upbringing in the Borders. Following the album launch on Friday, Phamie returned to Spain in San Sebastian which she was really looking forward to. However, it won’t be long before Phamie is back over to these shores as she joins the line-up for an Edinburgh event at the end of the month. “San Sebastian is a beautiful location and they put me up in a fairytale castle set high on a hill,” she said. “It’s really magical, particularly as the sun goes down. “After that I’ll be back in Edinburgh for a solo concert on August 26 as part of the InterFaith Festival at St John’s, Princes Street. And Phamie’s busy summer doesn’t stop there. After her stint in Edinburgh, Phamie will then be setting off for a tour with the highly acclaimed TapEire which sees her travel to Canada, Broadway, Miami and London’s West End before heading off for Johnannesburg.